Description: Milan. Impressive Bird's Eye View of the city with crests, figures and text panels. Latin text on verso. Coloured. Description: Spectacular map in wonderful original colour showing the city of Milan, surrounded by smaller maps of the other fortified cities within the region. Description: Milan. City plan and panoramic view. Original colour. Description: Detailed city plan with architectural elevations on lower edge. Published by the Society for the Diffusion of Useful Knowledge. Original outline colour. 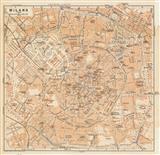 Description: Detailed German language map of Milan. Printed Colour. Description: Milan. Detailed city plan. Printed colour. 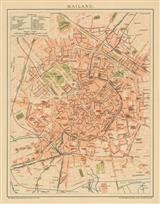 Description: Milan, a miniature city plan published as a guide for visiting tourists. Printed colour.